Yesterday November 29th, our baseball poet laureate turned 82! We love you Vin! Happy birthday!! Here is a Vin Scully short video that you will love from the California Sports Hall of Fame org: LOL. I love what Vin tells Tommy at the end! 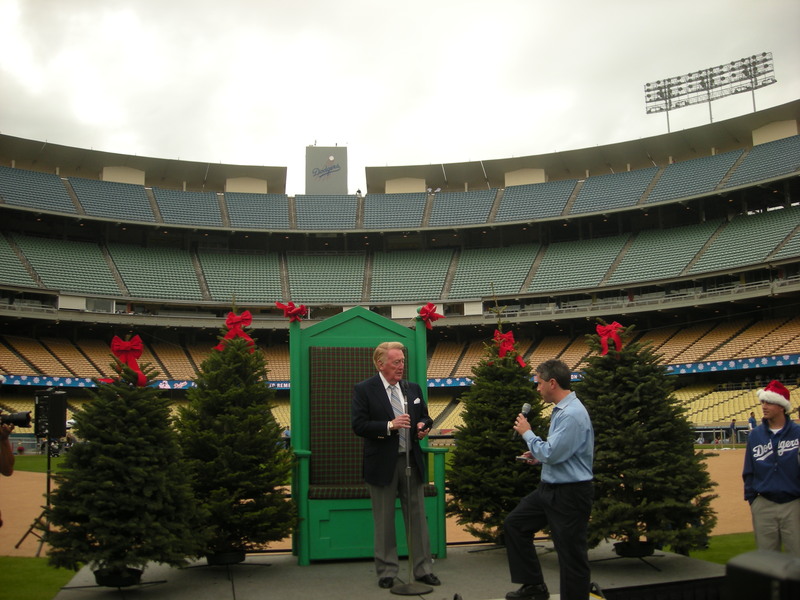 Is too bad that this year we will not have the Christmas event for Dodgers season ticket holders. 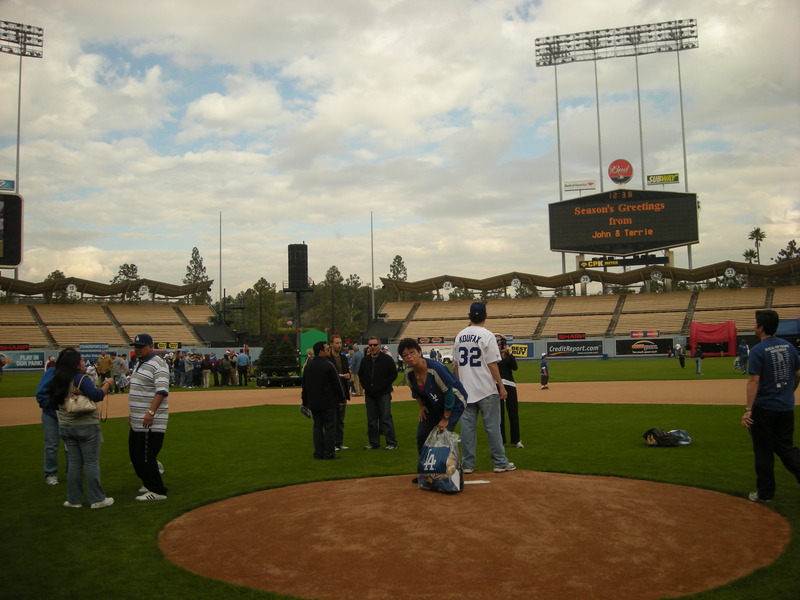 Last year, my friend LTD23, Erik and I had a ball at Dodger Stadium. An extra bonus was that Vin Scully showed up. Here is a pic I took last year! It was an overcast day but we had a wonderful time! After Erik and I yelled our customary greeting to Vin with “Vin Scully, we love you!” Vin looked at us and smiled. He talked about how the stadium is like a person with open arms, about the sky with some clouds but that us fans were brighten up the day :-). At the end he took notice of this little girl in the front with wings on telling her and other kids “you better watch out, you better not cry, Santa is coming to town….” Afterwards Tommy Claus waddled to that area. It was a great event for both kids and adults. Yes, Vin, it was a day filled with clouds, but YOU brighten the day by being there! May you continue to enjoy broadcasting games and brightening our days! 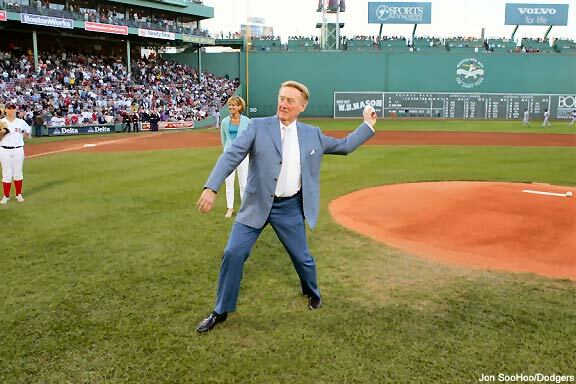 Here is Vin throwing out the first pitch at Fenway Park. That was the last time the Dodgers were at Fenway! I hope Vin does goes again next year! A Happy belated birthday also to Ross Porter who shares a birthday with Vin! Ross turned 71! What have I been up to lately? Well for me, is the busiest time at work from November till February so I am thankful that it is during the baseball off-season. I have also been in a reading binge. My last three books? Well, one had zombies, and the last two? Vampires and werewolves. I am shuddering the fact that some day we will not hear his silky voice over the airwaves or on the Television. What a sad day in Tinseltown it will be too. For Vin Scully is one of the true voices of baseball to me. Sure some might add Harry Carey to that list or recently departed Harry Kalas, but there is only one guy who can handle both a commentator and an analyst position during a game and it comes out a masterpiece. Happy Birthday Vin, and I truly hope you have a hundred more! Well said Rays! I was going thru my closet organizing my clothes when I ran into my Vin Scully pin! I was so happy. I thought I had lost it. I have not seen anymore at the stadium. I repeat your great sentiments sent Vin’s way! Wow, can’t believe he’s only 82. I mean, he doesn’t look that old, but my great grandpa told stories of listening to Vin Scully. Now that was a long time ago! Very cool that Vin has the same birthday as Mo Rivera – two baseball greats! Happy Birthday to Vin and may he keep broadcasting for a long, long time. GREAT PICTURES! Happy Birthday to Vin and I hope he had a wonderful day! And Emma I hope you are having a wonderful OFFSEASON….super busy but a good one! Take care! Isn’t great that so many of generations have listened to Vin? Glad you mentioned that Mo also has a bday on the same day! Not much to read in the newspaper. I look for baseball news and the rest I only glance at it. Hope you and your familia are having a great offseason. Yeah, I know what you mean. Spring can’t get here soon enough. Scully is not only the voice of the Dodgers, but all of baseball. The christmas trees look nice out there in SoCal. Just add snow and itd be the ideal winter wonderland on the baseball diamond! You are so right! Vin is the voice of Baseball. I was lucky enough that I got to hear him doing Football and golf. thanks! Emma, don’t leave me wondering what books you’re referring to! I’m going to have to guess that the “vampires and werewolves” refers to the Twilight series. What about the zombies? Maybe “Pride and Prejudice and Zombies”? I myself just finished Stephen King’s “Under the Dome”, a mere 1078(!) pages. The bad thing about really long hardcover books is there’s no comfortable way to hold them. haha! You guessed what I’ve have been reading. I am on the 4th and last book of the Twilight series (754 pages) . Wow! 1078 pages on your book! yeah, you are right. Those big books are hard to hold. So was the book good? Yes, it was good. It has a very large cast of characters, some of whom are truly despicable, but there are others who I found myself getting very emotionally invested in. The climax of the book almost brought me to tears at some parts, truly a first for me for a Stephen King book. I haven’t read too much of his stuff the past number of years, but this one was worth it. I’m just 27 but it’s hard to believe that even my father wasn’t born yet when Vin Scully first started working for the Dodgers. It will be hard to measure the impact on the team that Scully’s retirement will have. It can’t be good. I might have to check out that book but oh, I have so many books at home waiting for me to read them. I am almost done with the 4th part of the the Twilight series. You are young enough to be my son! 🙂 but I was not born ethier when Vin started working for the Dodgers! I thought you would like the one from Fenway Park. Hoepfully Vin will make the trip like last time. Wow, a living legend!! I hope Vin had a great birthday!! thanks for the shirts emma! I do fit compfortably into the extra large and gave the xxl to my football player rooomate. we both appreciate them very much. Merry Christmas! Glad you and your friend were able to use the shirts! I kept two of the four pack. yes, Vin is a living legend. If you get a chance, say to him in Denver! Well, I hope he will still travel to Denver. He does not travel further that. I wish I had half of Vin’s wit at my age! hehe, I am losing too.